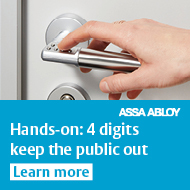 ASSA ABLOY Hospitality the launch of its cloud-based access management system, Vostio. The first cloud-based system of its kind designed for the hotel space, Vostio is a maintenance-free and universally accessible system that requires no local servers, providing staff with a user-friendly solution that allows them to efficiently manage all areas of a property from any location. Designed to maximize operational efficiency and enhance the guest experience, Vostio works to ensure that all properties across a hotel chain are equipped with the same high standard functionality and that all corporate guidelines are uniformly followed. With a focus on enhanced security and data privacy, Vostio is GDPR ready and built on the latest industry standards, ensuring total data confidentiality, integrity and traceability through the use of its encrypted system. As a cloud-based platform, Vostio also receives automatic software updates to ensure that properties are always fully protected against the latest threats and vulnerabilities. With no need for on-site servers, hoteliers using Vostio can also avoid both costly hardware expenses and time-consuming maintenance issues. Further reducing costs, Vostio’s also offers standardized monthly license subscriptions. Developed as a future-proof system, Vostio is equipped to seamlessly integrate with new property upgrades and is also compatible with existing door hardware. Vostio’s scalable platform allows it to meet the needs of any property, regardless of type or size, and can integrate with other cloud-based solutions to additionally improve efficiency and reduce costs.